« Ginger Made: RDC Gerard Coat!!!!! I really love these end of year posts and yours does not disappoint. And this line, “this is Frump City, Population Me. Also, HOLY COW, my FAR too anatomically-correct pattern placement!! !” had me laughing out loud. Your hits really are hits. I wish I could say this was the first time I’ve had an anatomical incident, but NO! I never learn with ikat!! Totally love your style, but if you were calling for votes for the top choice(s) of your big five, I’d have to go with the two that sent me scurrying to purchase the patterns in the hope of achieving Ginger-esque success: the Alder Shirt Dress and the Papercut Undercover Hood. Best execution of both and the reason I’m watching my mail. Thanks, Edie! They’re both lovely patterns and I’m sure you’ll be really successful sewing them! Happy sewing, and Happy New Year! I love round-ups! I really should do one myself, but knowing me, I’ll wait ’til late January and then give up on ever doing it. The most awkward pattern placement I’ve ever experienced I was actually able to avoid just in time, but I almost made a really cool paisley-esque fabric show the exact placement and shape of a uterus on the front of a skirt (http://laurasdailylookbook.blogspot.com/2014/09/revamped-skirt-92314.html), but I was able to catch it in time and shift it down – that would have been awkward! It turned out OK, but could’ve been a major disaster! Eek! Peer pressure is the best sort of pressure because it involves your friends! Did I misread that after-school special? The more you know, and so on. Dude. Your Isabel Undercover has me hankering for some wool jersey and alone time. I don’t love the way that sounded, but I’m just going to live with it. Also! You can rock a crop top and a midi, but I can understand why *that* crop top and midi aren’t your favorite. Keep hope alive for 2015, is what I’m saying. Mostly because I saw Mindy Kaling in a green Topshop crop and midi, and am now going to form a lady army around that particular uniform. Saddle up. Oooh, that outfit is SO cute! Make it make it make it! I think it helps that her skirt is slimmer. It’s sleeker and less… I dunno… VBS teacher-y? Your namaste top is definitely my favourite! Hence why I made two versions myself. I hear you on the bad cardigans happening to good people. I’ve been there! We live and we learn I guess. I LOVE your two… they’re so breezy and cool! Now I’m plotting a leopard version! Oh, yay! I hope you love it! I’m telling you… I barely wear anything but those sweatshirts these days! Happy sewing and Happy New Year! Oh man, I loved your pink Lola! But it is bright, that’s for sure. Is it possible to dye it a darker color? Yes maybe…I’d just like it to be toned down a shade! Or for me to garner the confidence to wear such brightness! Loving your print choices. All good in the hits category. I also have a number of ‘misses’ that I have given away because I never wear them. It’s good to give them away, isn’t it? I just went through my closets the other day and pulled out everything that I don’t wear… it’s very freeing to get that stuff out of your life! Ooh yay, trousers! That will be a fun project! Happy sewing and happy 2015! Heeheehee, well, if they’re going to be flops, they may as well be entertaining, right? I’m excited to see what you get up to in 2015! Happy New Year to you and yours! I loved reading your post – especially the misses – you’re right they are more fun! Jackets are fun to make aren’t they? I have worn mine loads as well. I love the prints on your Alder dress and Nanette Scout Tee. Jackets really are fun! I’m struggling to stop myself from making more as they’re kind of addictive! 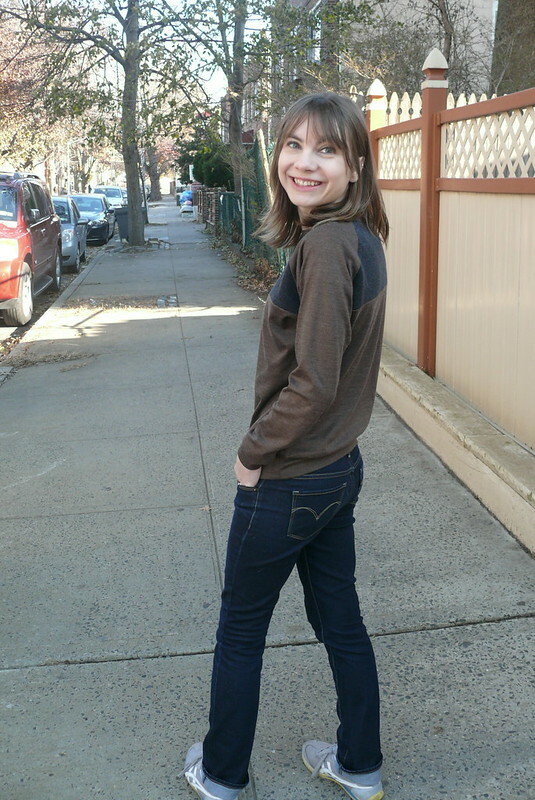 I’ve loved following YOUR blog! Have a wonderful NYE, and a happy 2015 to you and the family! Wow from all the prints here I can definitely see that you’re a fun person! Well done for all your hits and good luck sewing more flattering/appropriate clothing in 2015!! Thanks for the good wishes! Have a wonderful NYE and a very happy 2015! Oh nooooo too bad for the Honey cardigan ! Thanks for sharing this and Happy New Year ! Oh those buttons… how I hated them! 🙂 Happy 2015 to you and yours! Wow, such a great year in sewing. Loved seeing your hits and misses. I’m on a mission to sew more functional basics too. Happy New Year! It’s tempting to sew fancy stuff, but it’s so worth it to make things you can wear all the time! Happy 2015, Marie! It’s so disappointing when you spend time sewing something that’s not your style. The good thing is that you learn from it. Happy 2015! Absolutely! There’s no fitting room to try things on in when you’re sewing your own clothes, so it’s pretty unrealistic that you’ll love every single thing that you make, especially if you’re trying new styles. You gotta learn somehow! Happy 2015 to you and yours! I always have mixed feelings about the misses because I feel sad for people who have tried to make something that just ain’t happenin’ for them, but they always write about it in a way that has me giggling, you always included. 😀 I think your hits are spot on. LOVE that anorak in particular. I’m now laughing at myself because you asked us about hits/misses and I was going to mention my miss of a linen-blend black skirt that I never even bothered to blog about because it barely fits in the hips and the fabric just sits there looking weird to me, and then remembered I even mentioned not having a perfect black skirt in my own round-up post. Um, maybe I just don’t like black skirts after all?? Doh. lol Happy New Year to you, can’t wait to see more from you in 2015!! Isn’t it funny the way that we don’t always know what we like? I finally just donated a white buttondown that’s been hanging in my closet for about three years without being worn once… I felt like I should keep it, though, probably because those magazine articles like “20 Items Every Women Should Have in Her Wardrobe” always include a white buttondown. But, uh, turns out I don’t wear them! Waste of space! Wow so just skimming these, I thought they were all hits! Like, where were the misses? These all look great! I know when something doesn’t work for yourself, isn’t your style, or just doesn’t fit quite right it is a KILLER. Your hits are all so inspiring, though! And I can tell you like them because you just look psyched about them in the pictures! Oh how I love that awesome scout tee. If you ever get tired of it, you just send it my way!! Your hits are all fantastic! I love your comments on the crop top and skirt combo! I think I must have missed your anorak when you first posted it, but it’s fab, I love it! Also a huge fan of that sweater! I hope you had a good year, thanks for all the entertaining blog posts, and have a fantastic 2015! The same to you! I hope 2015 is a great year for you and yours! Heeheehee, I think it’s just a bit too 90’s! Or maybe a LOT too 90’s! Happy 2015, Carolyn! Fun post! I love reading everyone’s hits and misses. I *might* actually have time to finish my marathon Gingers today believe it or not. I love your Alder dress & your Scout Tee. They both make me long for summer (it was -20 here last evening & that didn’t include any wind…one of my Bostons’ little feet got so cold that he literally froze up & I had to go outside & bring him in!!!). Your hair grew a lot this year too! Next year I’ll have my own list now that I hope I’m past all my machine issues with my Gingers. 🙂 Oh, and I have sooooo many black pants. Haha! Get those Gingers done, girl! 😉 Oh and I totally understand why some people love black pants! It’s just one of those weird things that I don’t like for no real reason (like polka dots… everyone loves them, but for me, yuck!). Your hits are making me think I need to explore some bold prints next year! And I can imagine many people wanting to take those “miss” garments off your hands – they’re still look beautiful and well-made even if they’re not right for you. 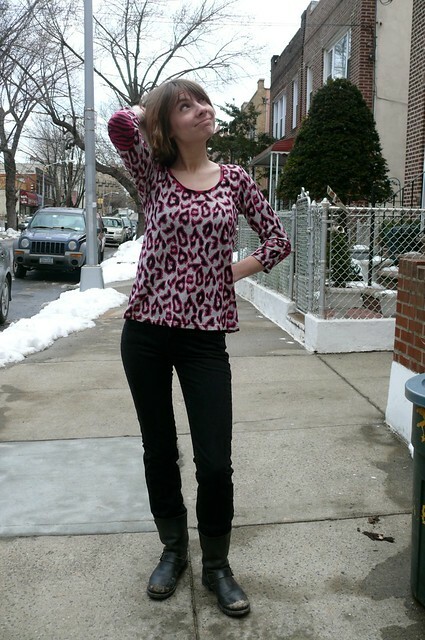 Hopefully someone did like them… they all got donated (with the exception of the sweater, which went to my sister)! 🙂 I know some people have a hard time giving away handmade garments, but I really hate knowing that something I made isn’t going to get worn! Get ’em out and let them find a new home! Oh my gosh, Jo, I went back and looked at my top 5 of 2012 and whooo… my fails were all… major fails. 😀 It’s hard to notice change and growth in your sewing until you look at things you sewed a few years ago and realize you’re much better now! I learned to set a zipper into a dress, do button holes, bias tape facings, and machine blind hems. I got so much better at gathering evenly, sewing seams correctly the first time, and top stitching. I also learned to avoid brocade and do more research before cutting into a new to me fabric type. My biggest fail of this year is my first knitted cardigan. This was my first sweater ever I had the perfect mustard yarn, I measured carefully and swatched and measured the swatch and calculated that I’d have 1 inch of positive ease. My gauge relaxed as I knit to the point where I had about 5 inches of positive ease at the top. Damn thing wouldn’t even stay on my shoulders. So I tried to fix it and it didn’t work and now it’s frogged and sitting in a bowl on my stash table waiting for inspiration to hit me. But, that aside, sounds like you had a great year with lots of learning and growth! Learning to research fabric before sewing was a lesson I learned the hard way (silk taffeta ruined) but it’s a lesson worth learning, for sure. Happy sewing in 2015! I made the same pattern placement mistake too, also with a diamond-shaped print. Except the diamonds fell just slightly lower than my bust, so they looked like a bikini top that was sliding down. Bad. Really bad. But on the plus side, this is the first year I’ve made things that I actually wear on a regular basis. In 2015, my humble goal is to be less of a lameass at matching plaids and stripes. D’oh! How irritating! But how great to feel like you’re sewing things you actually wear! That’s such a good feeling. Grainline Studio and Amy Alan both have nice plaid-matching tutorials on their blogs, if you need any tips! Love your hits – perfectly you. I adore that Scout & Alder especially! Thank you, lady! The Alder sure is a winner of a pattern! Absolutely – I’m wearing one right now! And I wore the other one yesterday and it’s hanging on the line drying! I love all your hits. That anorak is absolutely brilliant. Am yet to brave making a coat, but when I do it will definitely serve as inspiration. Happy new year! Thanks, Ingrid! 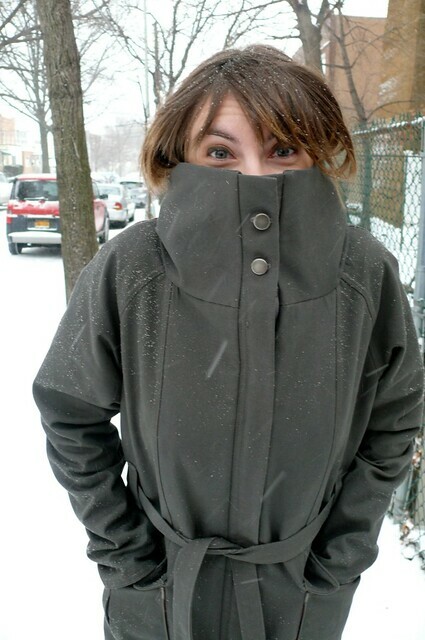 Coats are pretty fun to sew! You don’t have to obsess over fit and you get to use fun hardware, if you want to! 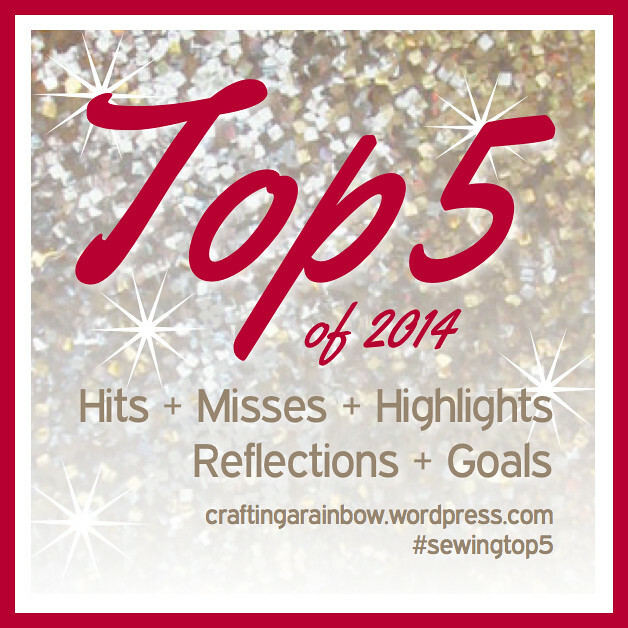 Happy sewing in 2015! You made some fabulous things this past year, young lady! Thank you, Anna! Happy 2015! you have such a fun style. you made some pretty amazing stuff this year – your misses really arnt bad at all! my fav of all your makes this year has to be your wax print alder. it so perfect! I love everything print on you! I think my favorite is the scout tee hack – so fun! Thanks, Kerry! It’s a nice and easy dress to wear. Happy 2015 to you, the babe, and the Current Husband! I love your hits! I’m a sucker for a bold print, and you definitely wear them well. 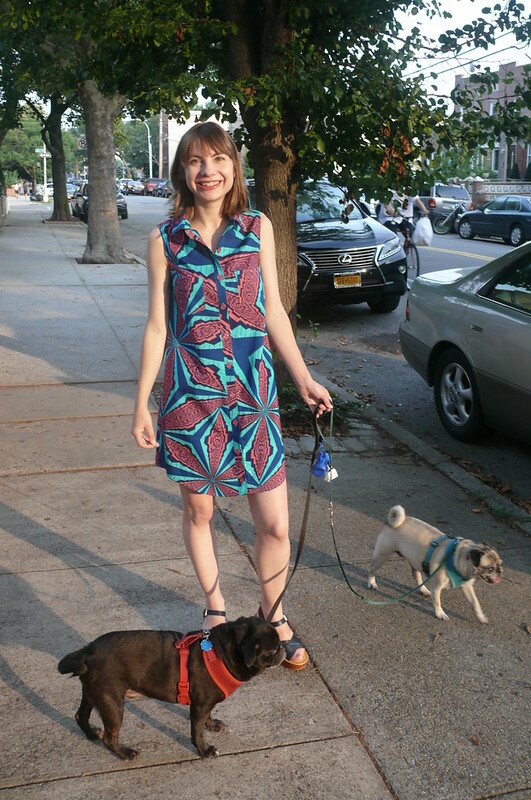 I also prefer to sew for my everyday wardrobe, and using fun prints and colors makes it far more interesting! And that Alder… so, so cool! Man, I can’t wait for it to be Alder season again! Can we just skip through the rest of the winter? Your hits are brilliant, you really do know your style and rock it well. You look so much happier in the hits. Whilst your misses aren’t awful by any stretch, you have definitely made better, still live and learn and all that! Happy New Year! I love your makes, your hand made wardrobe makes me smile, they are happy clothes! My favourite has to be your scout tee. I’m surprised your Gerard coat isn’t in your top 5. I’m finally making mine after sitting on the pattern for over a year. I started cutting out after seeing your blog post. Oh yay! I’m glad you’re making a Gerard! I might be crazy, but I’m thinking about making a second. It’s a really wearable shape! I love all your makes… Really I do. You seem to know who you are and what you like which is wonderful. Happy New Year!! Thank you so much for your kind words, Sasha! All the best to you in 2015! Honestly… I’m not sure why I knit sweaters at all! I’m about halfway through one right now that I’m pretty sure is going to be a big fat fail! Lady, have a wonderful 2015! I’m so excited for you and can’t wait to hear about the baby’s arrival!!! Happy New Year to you, lady! Honestly, I was underemployed for a chunk of this year, so that’s why I got so much done! It is more fun to start with the misses but your hits are great… LOVE that Alder shirtdress in Vlisco fabric, it is wonderful! Thanks, Mikhaela! 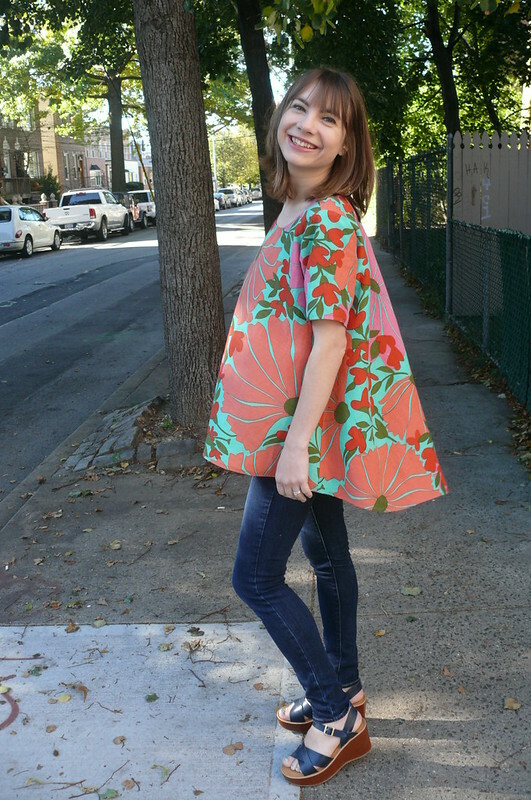 It’s easy to feel happy in a fun print like that! All the best to you guys in 2015! 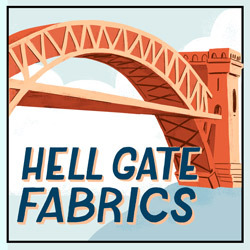 You made lots of great garments this year! I love your bold prints! Can’t wait to see what you make this year! Happy New Year!! Thank you, Heather! Right back atcha! Heeheehee, I loved that one, too! It’s so silly! I keep getting ‘hints’ that I should have a go at the Alder pattern (and the Archer too for that matter). I was reluctant cause I failed at putting on a collar on a dress back in July and left it until last month. It finally got on and it wasn’t that hard after all – ugh why? Regarding the Laurel dress, I read a discussion somewhere that the Merchant and Mills ‘The Camber Set’ dress is similar but was found to have better fit. It might be worth a try if you want that silhouette. I’m a fan of Merchant and Mills, yet it rarely features in the blogosphere, probably because their target market might be women twice my age. Isn’t it funny the way that things are almost always more difficult in your head than in reality? Collars really aren’t bad at all! There’s a tutorial on Four Square Walls that I found really helpful. I’m wondered about the Merchant and Mills pattern! I saw it on a blogger and thought it looked really nice. I’ve never seen those patterns for sale in the States, but it might be worth paying for the postage! 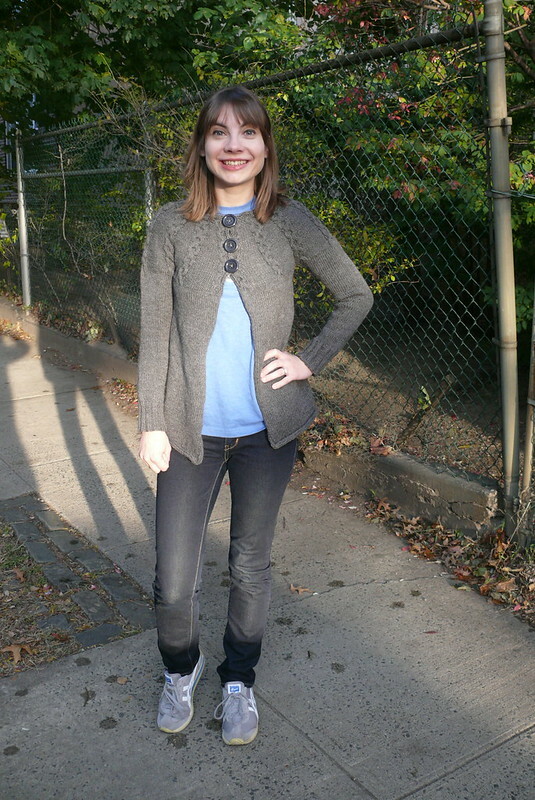 Your hand-knit cardigan looks great. Still, here are fixes you might try: 1) make the button holes smaller by sewing a few stitches at one/either end of the hole, get different buttons (or make self-yarn buttons…google “Isa’s Yarn Button”; OR 2) pick up stitches along the front edges to knit new button bands. These bands don’t need to be very wide, and don’t even need to run the whole length of the sweater if you still want the open look around the midriff. VERY SALVAGEABLE.